Mops are great tools for keeping floors clean. Foot traffic can lead to dirt and germs in your house. Even if you sweep or vacuum regularly, mopping is the best way to clean hard floors. A common concern about mopping is its effectiveness. A dirty mop will just move the filth around the house and not clean the floors. However, a clean mop and good mopping technique will effectively remove grime and germs from the floor. With a few easy steps, you can keep your mop sanitary so that it successfully cleans your floors. Rinse the mop thoroughly after each use. When you are finished mopping, rinse any cleaning solution and dirt from the mop in a sink until the mop is completely clean. Traces of dirt will spread grime during the next use, and leftover soap residue can damage your mop. Wash your mop. If your mop is machine washable, use the washing machine to clean it. Follow the cleaning directions on the mop. A gentle cycle at the hottest temperature is usually recommended. If the mop head is not machine washable, create a mixture of half water, half bleach in a clean bucket (enough to cover the mop head), and soak the mop head for 15 minutes. Rinse the mixture from the mop until the water runs completely clear. Allow the mop to completely dry. To prevent bacteria growth make sure the mophead is dry before storing it away. To do this, start by wringing the mop out as much as you can. Then place the mop head outside on a clothesline; sunshine will naturally kill bacteria and mold. If that's not possible, stand the mop upright in a bathtub or other well ventilated and dry area. The goal is to avoid mildew and bacteria growth. Once mildew has begun to grow, the mop is no longer effective as a cleaning tool. Mopping with a mildew-y mop will just spread bacteria and odor around your house. Store the mop properly. A cool, dry place is a perfect storage location. Try hanging it so the mop head avoids brushing against the floor. If you've allowed the mop to dry thoroughly, the mop should be fine for the next use. Replace the mop head when needed. Prevent your mop from becoming a cleaning hazard by replacing the mop head. Aim for a replacement every two to three months or sooner if it looks very dirty. 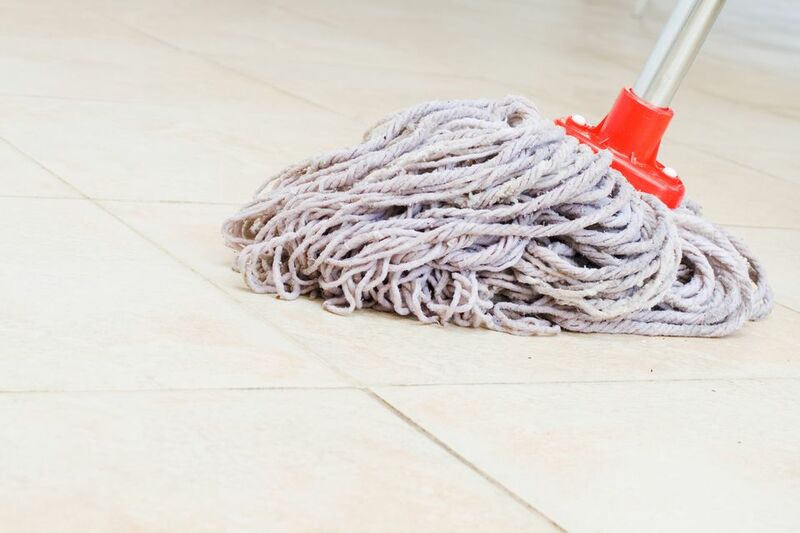 Your floors are only as clean as your mop head; a soiled and worn mop will not be effective. To keep your house clean, you may want to consider mopping with two buckets. Keep plain water for rinsing in one bucket and detergent in the other bucket. Start with the detergent bucket, mop the floor, and then dip the dirty mop into the rinsing bucket. Squeeze out the water and continue alternating buckets until the floor is done. If either water bucket becomes too soiled, replace it with fresh water and cleaning solution. Finally, try mopping the bathroom last, or even using a separate mop for just the bathroom. These rooms are full of germs and can lead to cross-contamination if a dirty mop gets used around the house.